Enchiladas are a tasty treat and for those of you who are looking to watch your weight, a low fat cheese enchilada recipe is a healthy dinner choice. Enchiladas are so easy to make that I'm surprise they haven't taken the place of the casserole on America's dinner table. All you really need to make enchiladas is a good recipe for enchilada sauce and some corn tortillas. The rest is up to you because you can fill the enchiladas with whatever you like. 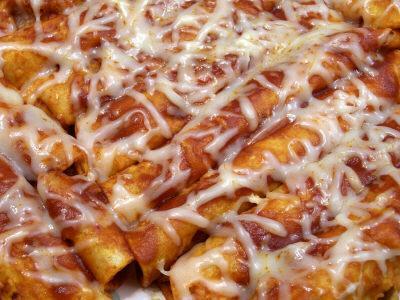 Before I moved to California, I had very little experience with enchiladas. I always got them confused with tamales and when I went to a restaurant to have them, I would just order one or the other and hope for the best. Since then, I have made them several times and I understand the pleasures of the enchilada. They are very flavorful and versatile. Your enchilada sauce can be made from scratch if you like and, as long as you are adding chilies to it, you're in the zone. The word enchilada means "in chili" as in they are cooked in chili sauce. We were looking to stay as traditional as possible and with that in mind, searched for a low fat queso blanco, the cheese that is usually used to make enchiladas. The reason that queso blanco is the enchilada cheese of choice is that it does not melt when heated, but just gets soft. So, the enchiladas keep their shape and the cheese does not just flow out of the tortillas leaving you with a plate of cheese and an empty tortilla. I was able to find a low fat version of queso blanco at my local supermarket but I wanted to try a couple of other cheeses to see if they would hold up to the needs of the low fat cheese enchilada recipe. To keep with the spicy nature of the original recipe, I tried a pepper jack cheese and a Monterey jack cheese just for fun. All these cheeses worked well, but we found that we liked the queso blanco for the filling and the pepper jack as a topping. Our final list of ingredients included onions, garlic, red and green peppers, corn tortillas, and our own enchilada sauce. I wanted to add some fun flavors to the cheese and went with red and white onions, red and green peppers, and some garlic. I wanted to use shallots as well but they were taken away from me with the admonition "This is not a French recipe...you don't get to use the shallot this time." Using the remaining ingredients, I sweated the peppers with the garlic and most of the onions in olive oil. I mixed the sweated onion/pepper mixture to the grated cheese and then added the uncooked onions into the cheese for some crunch. Chefette wanted to do the frying of the tortillas and, in usual form, I insisted that we use my cast iron pan for the frying. We worked out a method of dipping the corn tortillas into the oil (one at a time, please) just long enough for them to start bubbling. Then, we lifted them out and dipped them very quickly once or twice and placed them on a drying rack to cool. Chefette fried the tortillas and I took them, as soon as they were cool enough to handle, and rolled the cheese into them. In a 12-inch pan, put enough olive oil to just barely coat the bottom of the pan. Set over a medium-low heat. Add the peppers and almost all of the onions. Slowly sweat the onions and peppers until the onions just start to become translucent. Add the garlic and continue to sweat until it becomes fragrant. Once the onion/pepper mix is cooled, mix it into the grated low fat queso blanco. Add the uncooked onions and mix thoroughly. Add an inch of vegetable oil to a pan that is at least two inches deep and heat to at least 350 degrees Fahrenheit. Using tongs, dip the corn tortillas one at a time into the oil until they just start to bubble. Remove the tortilla from the oil and dip them one or twice very quickly. Place on a drying rack or a paper towel to drain and cool. Once the fried tortilla is cool enough to handle, place about an ounce of the cheese mixture in the middle of the tortilla, enough to go across the tortilla with about a half inch margin on both sides and about an inch high. You should have enough cheese for about 12 enchiladas. Coat the bottom of a 9 x 13 oven ready dish with a little of the enchilada sauce. Place the rolled enchiladas in the dish seam side up. Cover the enchiladas completely with sauce. Sprinkle a little of the pepper jack cheese on each enchilada. Bake for 15 to 20 minutes in a 350 degree oven.